The drones soared, most weapons fired, many queens were taken down, and all battles have been fought. DroneClash 2018 has happened! Welcome to the write down of DroneClash 2018, if you are looking for who won go here. DroneClash is, and always has been, a multi-angle experiment. “I want to get the tinkering back into drones, I want to have fun with drones again, indeed I want to give the counter-drone industry a push with some unexpected views. And maybe I wanted to see if the authorities would allow us to clash drones, all in the name of science of course.” says Kevin van Hecke, co-organizer of DroneClash. Well, we succeeded in that mission. And then some. For those that aren’t clear on it yet, a quick rundown. Each team starts with at least two drones: a Fighter and a Queen. Each team can have multiple Fighters, as well as additional Queen Defenders. The goal is to have your fighters take down the rival queen. Additional points are awarded by hitting, grounding, or capturing other drones. 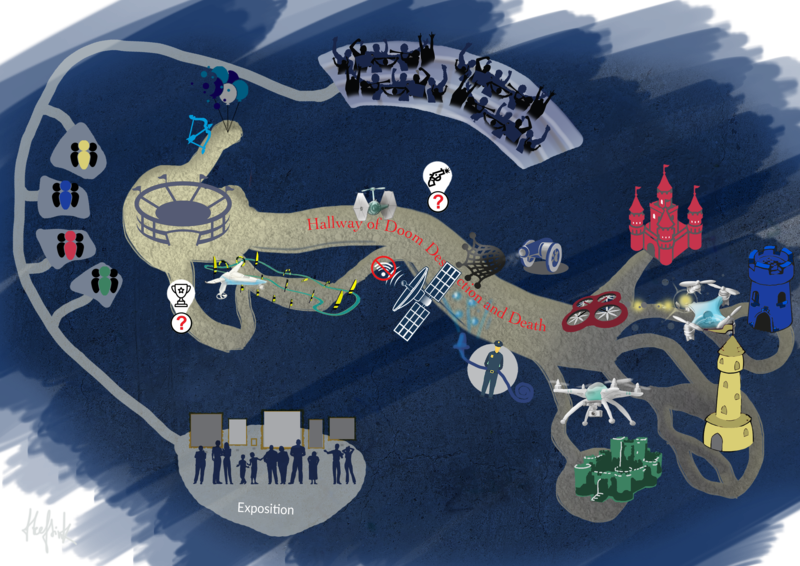 In between the Fighter arena and the Queen arena lies the Hallway of Doom Death & Destruction, in which we placed counter-drone systems. The first battle was the Laced Horns versus DeceptiDrones. Gadgets versus skills, flashy colors vs stealth. Countdown… Start! The first battle was away. The fighters from the Laced Horns were fast. Very fast. Without hesitation they left the DeceptiDrone fighters in their own dust and headed to the Hallway. Before anyone realized it, the Laced Horns shot through and arrived in the Queen Arena. They hit the DeceptiDrone queen hard, it did not stand a chance. It was over in less than 30 seconds, with a clear win for the Laced Horns. This set of events would turn out to be a recurring theme for the Laced Horns. “Skills and speed, just as we thought it would”, an ecstatic Geert Fokkema shouts, team captain of the Laced Horns. 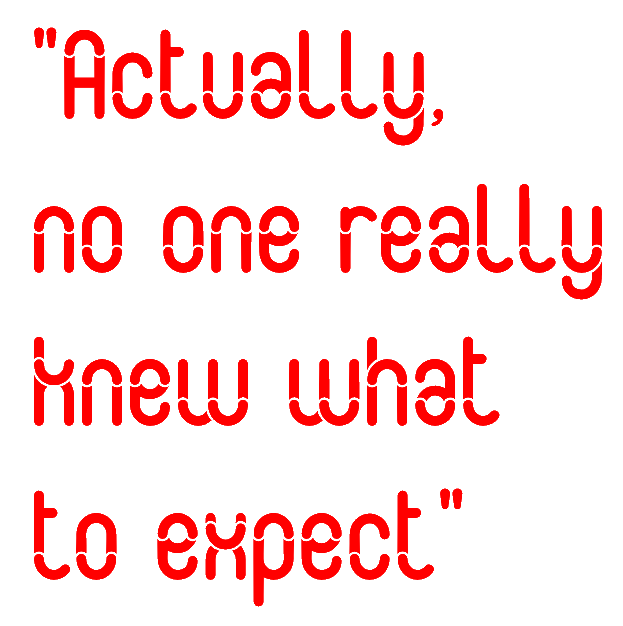 “Actually, no one really knew what to expect. It showed in the first round of battles, gadget-teams that fought against fast or skilled piloted teams were unmatched and sometimes over in mere seconds. We expected the queen take-down to be a very hard task, it wasn’t. We expected that too many drones would fall victim in the Hallway of Doom Death & Destruction, at the hand of the counter-drone measures conspicuously put there. In reality none them were even scratched” says Bart Remes, co-organizer of DroneClash. Food for thought, also for the counter-drone industry. One of the questions we’ve answered many times: what did actually come out of DroneClash in terms of value for the industry? It’s a question also asked by the Ministry of Security and Justice, partner of DroneClash. Well, obviously the drones were all but impervious to our own counter-measures in the Hallway. It turns out that the drones used in DroneClash, some of them not that unrelated to ‘normal’ race-drones, have little to fear from blinding stroboscopes, thick smoke, or even a handheld net-cannon. Too fast, too small, too strong. A lesson in itself. There were other outcomes too. Most notably, a novel technology was developed by one of our teams FBC2T, the letters being the letters of their first names. This team was another gadget team pur sang, they had developed two huge drones which they packed with everything they could think of. Confetti cannons, flamethrowers, paintball guns, you name it. But actually, their most important weapon was not in the arena, but just besides it. They had employed a hacker, who was able to do a highly intelligent attack on the control signals of the rival drones. In theory, given enough time, the team could overtake controls of any enemy drone. In practice, things were simplified: the plan was to just land them. “There is theory, there is practice, and there are DroneClash battles”, says Amber Marijs co-organizer of DroneClash. In the chaotic aftermath of the first battle, FBC2T and A3T had to quickly set up their drones for the next battle. 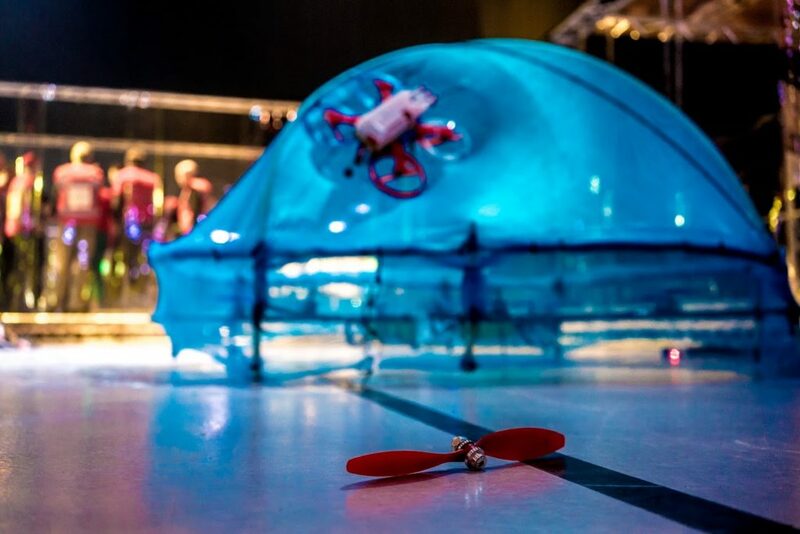 FBC2T struggled to get their enormous drones in place, and in the process some of the complex electronics got intertwined with the complex software. It unknowingly changed the ID of their Fighter. It caused them to inadvertently hack their own drone with the new ID. They did however also hack the enemy fighters, for this they gained points. The concept was proven! FBC2T’s hacking is an amazing feat, more so because this is potentially a legal way to both detect and counter a drone. The team was awarded the Innovation Award by the jury. In their next battle, against the Laced Horns disaster struck for FBC2T. Although they implemented hacking for all most used protocols, the Laced Horns used another protocol. FBC2T knew that for this battle they would have to change their strategy. The last-minute changes, the time pressure, the little sleep. It caused them to rush things. The countdown started anyway. Start! Laced Horns soared off. FBC2T fired their weapons, but nothing happened. The Laced Horns did not wait around, and quickly finished the job in another spectacular combination of speed, skills, and force. Even against a blue ‘jellyfish’ drone 10 times their size. Though this is exactly what happened during the third battle with Dipol versus ACRO. Simplicity versus strength. Both were teams focusing on speed and agility, both had trained FPV racers at the sticks. Unfortunately, early in the battle the ACRO pilots reported that their signal was being jammed by another drone. In this year’s rules, we explicitly not allowed jamming. The DVR recording of the FPV feed was not 100% clear on what was the jamming cause, but still team Dipol decided out of their own will to grant them a rematch. A champions move, as there was a fair amount of luck involved in the early battles. In the end it didn’t change much. Both teams raced their fighters to the rival Queens, attempting to clash them out of the sky. But it was team Dipol that could take bigger risks and resist the violent clashes. The Queen of ACRO turned out to be the weakest link. One innovative trick developed by team Dipol was the fact they could switch between drones, without interfering on one another’s video signal (a team was only allowed two video frequencies). With their carbon outer skelet Dipol’s drones certainly looked the part, and with their skills the Dipol pilots really played the part as evidenced by a small victory stunt show performance after the ACRO Queen went down. All part of the show. These were just the starter battles. The (semi) finals are actually better fun to just watch instead of read. Some patience on this is still required, as we working hard on editing them. We will post an update once they are done! And also on what will be the future of DroneClash!